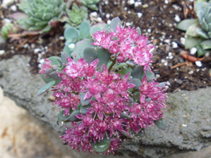 Grown extensively in rockeries and dry gardens, Sedum cauticola is a well known species. It's reliable, hardy and very pretty - all the attributes of a great garden plant - this one is easy to grow and excels in drought tolerance, making it a perfect candidate for planting on green roofs. The puffy blue foliage is almost obscured by the magenta blooms held on wiry stems in late summer. This is another great plant for bees, attracting many of the larger bumble bees during August when it blooms. It can be used in borders, troughs and other containers combined with other contrasting forms of Sedum, hardy succulents and alpine plants. Eventually spreading to a width of less than 30cm, and with a slightly mounding form, this is an extremely polite addition to your collection. The hot pink clusters of blooms attract many pollinating insects. It’s somewhat prone to a couple of foliage problems such as dieback, but if kept dry through the growing season and watered only from below, this won’t be a problem. Prune hard to promote new bud formation in late summer after blooming to prevent bare patches in the middle of the clump.